Der M4A3E8 Thunderbolt VII ist ein amerikanischer premium mittlerer Panzer der Stufe 6. Der Thunderbolt VII unter Befehl von Lieutenant Colonel Creighton Abrams, dem Befehlshaber der 37th Tank Battalion (später General und US-Armee-Stabschef). Das Fahrzeug war im Grunde ein M4A3E8 Sherman mit Zusatzpanzerung, die im Feld angebracht wurde. The M4 Thunderbolt is a premium variant of the the M4A3E8 Sherman, falling somewhere between the standard E8 and the Sherman Jumbo in terms of its stats and playstyle. While the E8 is faster and more agile with better DPM, the Thunderbolt has better gun handling and armor, granting it better survivability than the standard E8. The Jumbo may have access to a howitzer and a more impressive weight of armor, especially on its stock turret, but the Thunderbolt has superior mobility and flexibility, allowing it to react more quickly when new threats or opportunities arise. The Thunderbolt is truly a 'jack of all stats' tank, as it falls squarely in the middle of all the Sherman variants at tier 6 in a way that the Fury does not quite manage. It is extremely forgiving of player error and is able to hold its own in most situations. It serves well as part of a medium wolfpack, or in hilly terrain as a support tank. Because of the gun depression, spaced armor panels, and thick frontal armor, a hull-down Thunderbolt can be an unusually tough customer, to the point that it can reliably absorb or bounce shots from any gun with 175mm of penetration or less, including the common 122mm D-series guns on higher-tier Russian heavy tanks such as the IS. The improved aim time, accuracy, and dispersion of the Thunderbolt's gun allows it to more precisely aim for weak points or have a chance to hit distant/moving targets. The main weakness of the Thunderbolt is that its standard 76mm M1A2 gun is an average gun at best on a tier 6 vehicle, especially with this version's lower rate of fire and the same 128mm of penetration, which can be insufficient against even some same-tier mediums. Flanking is a must, but unlike the E8 or Cromwell, it cannot simply rush to its desired engagements points first, and so must rely on its armor to help it into position. Some knowledge of angling is vital to survival in the Thunderbolt, as while it has distinct weak spots, it also has the uniquely un-Sherman quality of possessing enough side armor to actually sidescrape thanks to its spaced armor panels. Good terrain resistance and low turret dispersion means that it can also turn its entire hull in a fight to bring its strongest armor to bear against an enemy, allowing it to have some defense in a brawl that a vehicle like the E8 would otherwise lack. The Thunderbolt's basic strengths allows for some flexibility in its equipment fit. Though a gun rammer can be considered mandatory, the remaining two slots allow for some intriguing variation. A combination of coated optics and vents allows for excellent sight ranges and a reload time under 3 seconds, to the point where it starts to feel like a British 6-pounder gun. Pairing coated optics and a vertical stabilizer is the classic flanking medium setup and remains an effective selection on the Thunderbolt for the same reasons. A vertical stabilizer and vents improves the widest array of stats, especially in the area of gun handling (though at the cost of overall view range). It can also make use of less-common selections as well--a toolkit is not an unreasonable selection due to the large tracks, and it is also one of a handful of mediums that genuinely benefits from the addition of a spall liner to limit the stun effect and crew injuries from high-explosive fire (a serious concern for any tank that shares a tier with the KV-2!) as well as improve its ramming options (see below). There is an unusual strip of armor protruding from the bow of the hull that averages 150mm of thickness. Though of no use defensively due to its narrow size and awkward placement, its location and designation as spaced armor effectively allows it to act as a ram bar. This means that a Thunderbolt going for a ramming attack will receive somewhat less damage than usual and often return more of that damage to the enemy. The Thunderbolt is the heaviest of the Tier 6 Shermans, so if ramming is required it will stand a chance of doing decent damage. The Thunderbolt is a tough and flexible medium tank with many desirable characteristics, especially for players who prefer vehicles with overall balanced parameters. Its weaknesses may turn off players who prefer faster medium tanks, but with its survivability and pleasantly low operating costs, the Thunderbolt can be a profitable credit earner for a Tier 6 vehicle. As a premium tank the M4 Thunderbolt VII is elite in stock configuration. M4A3E8/M4A3(76)W HVSS (Easy Eight) - Upgraded with widetrack Horizontal Volute Spring Suspension (HVSS), fitted with the 76mm High Velocity cannon. 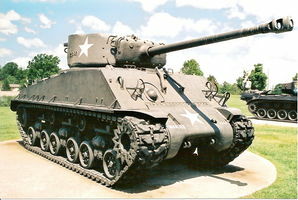 M4A3E8 at the Patton Museum of Cavalry and Armor, 2003. Diese Seite wurde zuletzt am 7. August 2018 um 08:16 Uhr geändert.